Another burst of snow looks likely on Saturday night, Jan. 26, with more lake effect for the first half of Sunday. 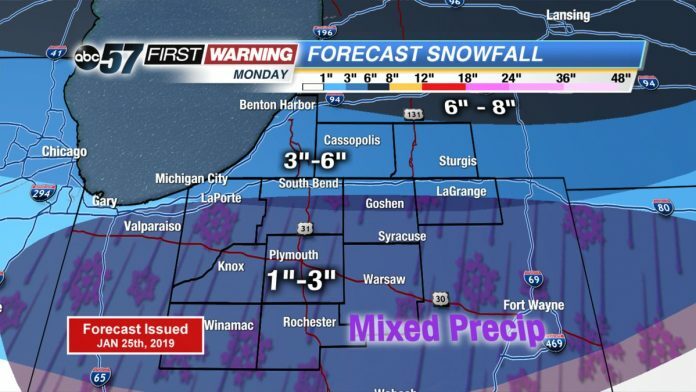 Only minor accumulations of 1”-3” are expected in the laek-effect zones and along and south of U.S. 30, with smaller amounts for everyone else. Temps this weekend continue to look cold with highs in the mid to upper teens. The focus continues to be on Monday’s storm. Totals around the toll road area stay around 3”-6” with 6”-8” for the northern edge of Michigan counties. South of the toll road could be tricky as a wintry mix could cut amounts down even more. After the snow, Michiana could experience potentially record-breaking cold. Highs on Wednesday will struggle to hit -5.
inch of snow accumulation is expected, but slick roads are possible. commerce are likely from Monday into Thursday. Saturday: Partly sunny to mostly cloudy with L.E. snow showers slowly fading. High of 16. Saturday Night: Mostly cloudy with another burst of snow possible. Low of 10. Sunday: Mostly cloudy with a chance L.E. snow showers, then partly sunny late. High of 16. Monday: Cloudy with snow likely. Highs near 30. Monday Night: Snow, mainly before 2am, then a chance of snow showers after 3am. Low around 9. Chance of precipitation is 80%. New snow accumulation of 1 to 3 inches possible. Tuesday: A 50 percent chance of snow showers. Mostly cloudy and cold, with a high near 9. Tuesday Night: A 40 percent chance of snow showers. Mostly cloudy, with a low around -13. Wednesday: A 30 percent chance of snow showers before 8am. Mostly cloudy and cold, with a high near -9. Wednesday Night: Mostly cloudy, with a low around -15. Thursday: Partly sunny and cold, with a high near 1. Thursday Night: Mostly cloudy, with a low around -6. Friday: Mostly cloudy and cold, with a high near 14.